I have two problems, the first one being my main concern. In my recording volume controls, the volume adjustments are grayed out. The playback controls are fine, but I can't adjust the input ones. In the Realtek HD Audio Manager, the input controls don't even have bars at all. Conclusion: something is stopping me from adjusting input controls. Note: this was my second time installing the audio drivers... I had originally installed them from Gigabyte. I can hear sound fine from my speakers and headset, and my microphone works... I just can't adjust the volume (I mainly want to adjust stereo mix). I've searched around and some other people have had this problem... the best answer anyone had was "maybe your drivers don't support it." Ventrilo uses Text-to-speech for various functions, but my text-to-speech is no longer working. No dice. Everything else works fine, I simply cannot hear text-to-speech. Any help on either of these issues would be greatly appreciated. is your onboard audio HD or AC-93? when you click on the "options" tab what does it pull down? what operating system are you using? 32bit or 64bit? btw...i may be able to help with the audio/mic issue but i know absolutely nothing about ventrillo. sorry. Under Options all I have is Properties... Advanced Controls is grayed out. The screenshot I posted in the first post is for Realtek HD Audio Input. I am having no problems with the output. Just Wondering if anyone has solved this. 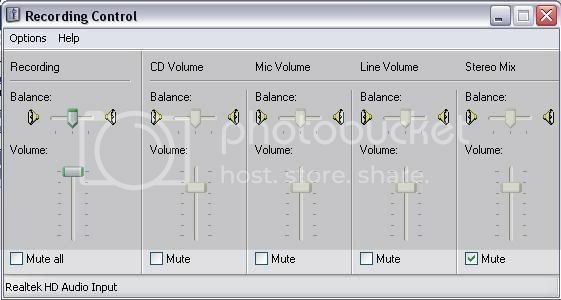 My Audio inputs are ghosted in Master Volume as well as in Realtek Audio Manager. The funny thing is Realteck had a tab to view Audio I/O. When I plug in the mini plug line in the thing lights up and get a pop up sayin i plugged something in a audio jack. So then, the connection is working, but no audio signal. Whad up? And yes, the Realtek Audio Manager recognizes that you plugged it in, because you are getting a signal... you can still use the microphone, right? You simply can't use stereo mix and some other adjustments. Yes the Mic works, but no good for audio recording. I hate to have to go buy a new audio card. The Line In levels are ghosted in realtek aswell. Is there a Audio driver that doesn't have Realtek Audio Manager attached?? -and i put motherboard in a new tower that has audio jacks in the front. the plug that plugs into the motherboard has two jumpers on it. i think this is what fixed it. thanks for posting back your results!